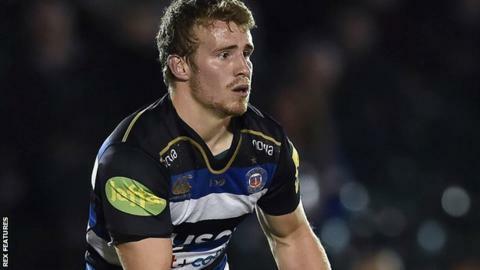 Welsh scrum-half Jonathan Evans will join Scarlets from Bath at the end of the season on a two-year deal. The former Wales Under-20 player joined the English Premiership side from Newport Gwent Dragons in 2015. Scarlets have already announced their scrum-half Rhodri Williams will join Bristol at the end of this season. "Having been unsuccessful in retaining Rhodri, we were keen to bring someone in with Pro12-level experience," said Scarlets head coach Wayne Pivac. "We were particularly keen to sign a Welsh qualified player and we're pleased to have secured the signature of Jonathan's quality." The 23-year-old made his senior Dragons debut in May 2010 and went on to score 11 tries in 81 appearances for the region. Evans has played just three games for Bath this season, facing tough competition for a place from Chris Cook and Niko Matawalu. Bath head coach Mike Ford told his club's website: "We've got some very talented scrum-halves in the squad, and we're sorry to see him (Evans) go, but I'm sure he'll be a great success at Scarlets." Evans added: "Despite not getting as much time on the pitch as I'd like, I do feel I've developed as a player since I joined Bath."